5. Comparison: Johnny and the Bomb and the recent TV adaptation. Welcome to issue 107. We appear to be meeting a critical mass with regards to adaptations of Terry's books at the moment. What with the recent Johnny and the Bomb television series, The Wee Free Men Movie and now officially the Hogfather television adaptation. Having seen how Childsplay adapted Johnny and the Bomb, I look forward to seeing how accurately the others are adapted. Joe Pattison, the sculptor of many of Clarecraft's figurines, has announced a repair service for Clarecraft's products. So if you have an unfortunate accident with your Rincewind or drop your Death - Joe will try to fix it for you. 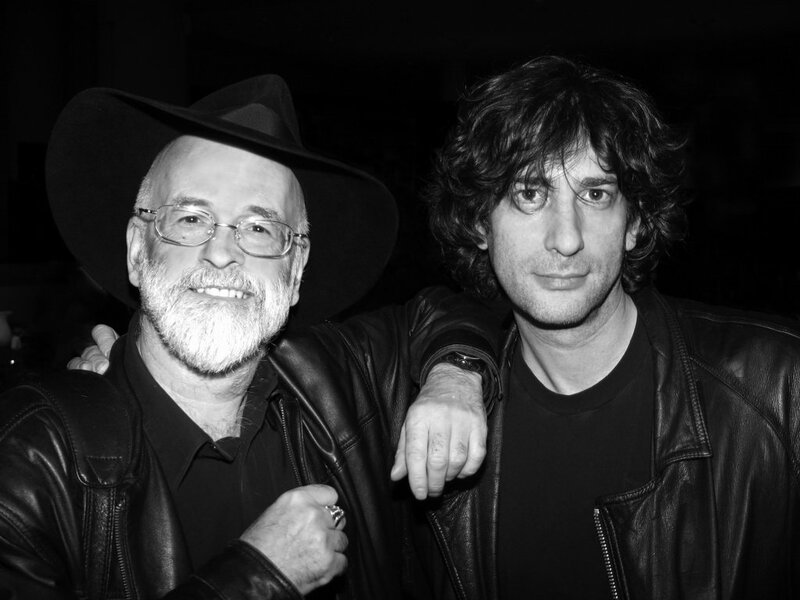 Neil Gaiman posted a very nice photo of himself and Terry that will appear on the back of the new Good Omens edition. 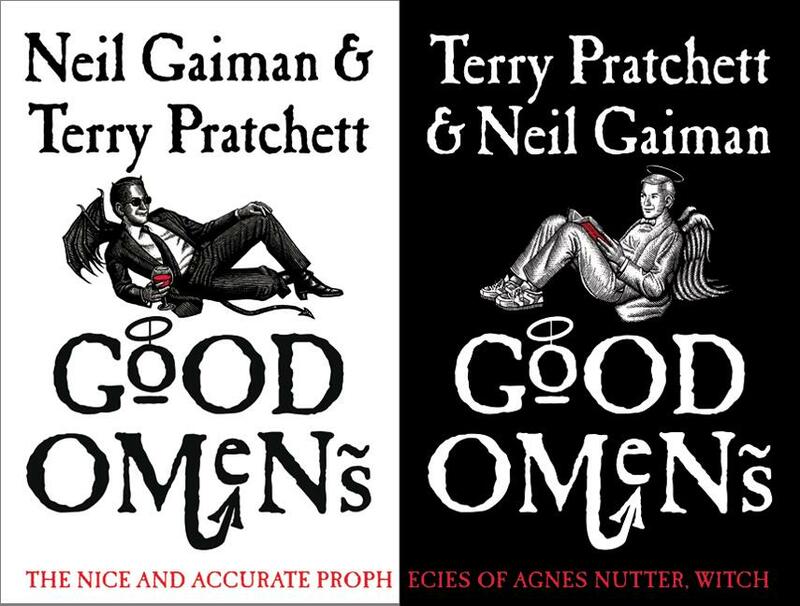 There doesn't actually appear to be an online method of buying a particular cover (short of going to a small online retailer like DreamHaven's www.neilgaiman.net and simply letting them know which cover you want), as each case of books will contain equal quantities of each book, and they share an ISBN. But they are both lovely. Publication date is the 28th of February, but I'm sure copies will trickle out early." BBC Radio 4 will be broadcasting its adaptation of Small Gods at 23.00-23.30 on 28th February, 7th, 14th and 21st March. It has been dramatised by Robin Brooks, directed by Gordon House and produced by Claire Grove. You should be able to listen to it on the web via the listen again system. [UK, Updated] Guards! Guards! is being performed at the Questors Theatre Club in Ealing from the 14-18th March. Tickets cost just 5.50 GBP - 13.00 GBP. [UK, NEW] The Stockport Garrick Theatre will be performing Lords and Ladies from the 10th-17th June. Tickets cost 7.50 GBP (6 GBP for concessions). Raye Johnsen is looking for a copy of the soundtrack to the 1998 animated version of 'Soul Music'. Christopher McGrillen writes: I can't believe it! I just can't believe it, they're not printing Nanny Ogg's Cookbook anymore. I have been searching for it for ages so I decided to order it into my local easons. During the time it took for them to order it in they had stopped printing it. Can someone please tell me if they will start printing it again? We assume any correspondence is eligible for use in the newsletter unless otherwise stated, including the sender's email address. We may also edit your letters and beat Rich soundly at Quake 4. I always have mixed feelings about Pterry's works being filmed; I feel strangely protective of them, having read anything I can get my hands on over the last 20-odd years (Gods, has it really been that long??) On the one hand I have the evangelist's fanaticism for passing on the Good Word, so it's great to see Johnny & the Bomb being given serious attention by the BBC. On the other hand, I find myself watching carefully for errors and omissions - not to the point of taking notes, but certainly squirming and biting my lip to stop myself telling all those around me that they missed a bit. If I had to make one criticism of JATB, it would be the casting of Mrs Tachyon. Zoe Wanamaker is too damn young and too damn clean looking! I think they missed the perfect opportunity to put Liz Smith in the role. Anyone who has seen her in the Vicar of Dibley making chocolate cakes coated in Marmite has to agree. I'm a long time lover of Terry Pratchett, desperately trying to rekindle my German but I'm finding it very difficult finding anywhere where I can buy German language books in the UK. Do any readers out there have any suggestions of where I can look? * From: "Debbie Savannah George"
People clearly love their Pratchett. I just joined a great online book swap www.paperbackswap.com/ They have over 318,000 titles available for swap - and not a single one of them is a book by Terry Pratchett! Moist von Lipwig, Postmaster General of the Ankh-Morpork Post Office would be proud of this. Anne Murphy wrote a postcard on her first holiday without her parents. A holiday postcard sent from Austria in 1972 has finally turned up at its destination in Kent 34 years later. Up until the last week or two I would never have considered myself to be an obsessive person. I have enjoyed spending several lazy years collecting up the Discworld series in no particular order, and although I've read them all, I'm yet to start at the beginning and read them all in sequence. BUT... on a recent trip to my local bookshop I was horrified to discover that the covers of the earlier books on the shelf no longer featured the art of Josh Kirby. Instead I was faced with some dark covers bearing a single photo 'icon' to represent the story. It was only then that I realised that the artwork was such an important part of the Discworld package for me. I was rigid with horror. I gather now, from looking at various websites, that publishers release a range of covers in different countries. But is the art of Josh Kirby gone forever from the shelves of XXXX? DWM replies: hpetken [cool name] gets this month's Letter of the Month. In another case of Life imitating art, it appears that Ankh Morpork is not the only place where the mail is hoarded. A postal worker who hoarded mail at her home appeared at Plymouth crown court yesterday where she was told she faced prison. Lisa Harvey, 31, said she had kept the 111,000 letters and packages at her house in Plymouth out of curiosity. When investigators tried to get into her house, they struggled to open the door because of all the post, which was piled up to the ceiling in some rooms. Staff spent weeks trying to ensure the mail was delivered, in some cases almost six years late. Harvey admitted theft and delaying delivery of letters. Sentencing was adjourned while a report was prepared. Having been a big fan of Terry for some years now.. I am 41 now, and finding his books hilarious, and even met the great man himself on a couple of occasions, it was only natural that you tell other folk about how great these books are. The main person I told quite naturally was the wife, she is 30, and said on more than one occasion; "no i'm not interested in those sort of books". Well it finally happened one night... she was in the lounge, I was in the computer room, and heard laughter, thinking there was a funny programme on the television, I came through for a look see.... only to find she was sitting reading the Death trilogy; her words were; "this is great...got any more?" ... so add on one new convert. All the best Bob, and now Vicky. * From: "Paul van Oven"
I've read all your newsletters, and am a subscriber from about number 20. I remember having read somewhere about the god of hangovers (Ohmigod). Near the town of Quepos there are two bridges in the coast road where you have to pray to the god for a safe passing. While both are single lane bridges, one has no sidewalk and pedestrians have to jump from one plank to the next and all other traffic has to wait till they crossed the bridge, and the other bridge has two sidewalks with about half of the planks missing, so the pedestrians have to jump even further to get across. Those who forget to pray will fall into the rover and may drown, as is shown by several photos posted on the entrance of the bridges. A fellow traveller mentioned that a few months ago he saw someone on a bicycle, who disappeared in the middle of one of the bridges: he managed to grab a plank and was rescued, though he lost his bike. I have just come into possession of a 1st edition, signed, with dust jacket, The Colour of magic. The only drawback is that it is an American club edition. Do you have any idea how much it is worth? This month I have decided to ask questions about The Colour of Magic. When Rincewind jostled into Death for the first time why was Death surprised to see him? Who or what is otherwise known as The Soul Eater? What is the name of the upside down mountain? When Hrun tosses a coin in the magical field which way up does it land? When Rincewind and Twoflower end up in an alternate universe what are their names? Watching the recent adaptation by the BBC of Johnny and the Bomb inspired me to dig out the book and read it again. It's been nearly 10 years since I last read it so I had forgotten many of the details. I am glad I did because I wasn't aware of just what liberties had been taken in adapting the book to television. I should make it clear up front that I thoroughly enjoyed the adaptation and felt that it certainly had a lot of character in it. It certainly felt like a Pratchett story even if it wasn't quite the one that Terry originally wrote. I was aware of some of the obvious changes that the TV series made (for example Bigmac's mobile phone and the Harry Potter references) but I hadn't realised some of the bigger liberties that the TV series made with the story. Strangely, something that I had not noticed before is that Johnny and the Bomb is actually a book about Wobbler rather than Johnny. Probably the biggest change was that in the book it is Wobbler's grandfather (rather than Johnny's grandmother) that gets killed by the Bomb in Paradise Street - this causes Wobbler not to be able to return to the future because he no longer exists there. I suspect that by changing it to Johnny's grandmother it makes the adaptation a story about Johnny rather than Wobbler. In the TV adaptation originally nobody was killed when Paradise Street was bombed. However, Johnny and the gang's actions caused 19 deaths - which they then managed to save again to finish off the story. In the book, however, 19 people originally died because the air-raid siren failed. Wobbler's intervention in the past caused his grandfather to stay in Paradise Street rather than return to London - and therefore get killed by the Bomb. In the course of rescuing Wobbler's grandfather the other people in Paradise Street also got saved. The TV's version provides a nice symmetry to the story and allows for a clean explanation, whereas although Terry's story has a positive spin, it does leave things a little less tidy. In the novel, the Wobbler that got left behind changed his name to John and eventually became Sir John. In the adaptation he simply became Sir Walter - again this was probably to allow for simplicity. Ultimately these changes didn't prevent the adaptation from being great fun to watch but did still show how much liberty is being taken with Terry's work. It is still undeniably recognisable but not the same. It will be interesting to see how Sky's adaptation of Hogfather this Christmas and The Wee Free Men in 2007 will compare to their original sources. Last month we teamed up with the very nice people at www.discworld.com to give you chance to win a signed copy of The Colour of Magic: Facsimile Edition. When was the original The Colour of Magic first published? The answer was, of course, November 23, 1983. We also accepted November 1983 and 1983 and correct answers. Unfortunately, somebody decided to spam the competition sending in over 260 mail merged entries. Whilst these were all correct they were disallowed. This was both a waste of time for the spammer and also for me. From the, over 240, non cheating entries I managed to randomly select Erin Elvin from Edinburgh in Scotland as the winner. As soon as we get Erin's postal address a copy of The Colour of Magic: Facsimile Edition will be on its way. The ever-popular Animated Versions of the Discworld Novels Soul Music and Wyrd Sisters were given a DVD boost recently when they were released in a Limited Edition Box Set with the paperback of Going Postal. The limited edition set was rapidly snapped up and is now best found in the dark realms of Ebay - but all is not lost! There is now a new Box Set available containing Just the 2 DVDs, RRP 19.99 GBP. The box design echoes that of the stylishly designed Limited Edition set, but thinner now that the paperback book is no longer included. Courtesy of Bonsai Trading (the online Discworld store), you can now get your hands on a spanking new copy of this Box Set. What is the name of the company that produced the Discworld Animations "Soul Music" and "Wyrd Sisters"? At long last the rumours of a Hogfather adaptation have been verified. Sky Television have recently confirmed that they are making a live action / CG animated four hour TV version of Hogfather in conjunction with RHI Entertainment. Sky have really backed Terry by allocating their biggest ever budget for a TV production. The six million pound production will be transmitted on Sky One over the Christmas period 2006. David Jason (Only Fools and Horses and A Touch of Frost) will star as Death's manservant Albert. Apparently Mr Jason is a Discworld fan, and will take a break from A Touch of Frost to film this role. "I am thrilled to be taking part in Hogfather", said Mr Jason, "I am a huge fan of Terry Pratchett's books and to play the part of Albert is going to be great fun." Further casting announcements should be made over the coming months. Filming will soon begin in Romania due to the need for vast studio space and ready access to mountain scenery. The Make-A-Wish Foundation UK recently asked Terry to help make a wish come true for Euan Macrae, a young man who is living with Ewing's Sarcoma [a type of cancer that affects bones - Ed] and just happens to be a huge Discworld fan. The charity flew Euan and his parents down from Scotland to London to spend a day with Terry. The day in question coincided with the press launch of the new Hogfather adaptation by Sky Television. Terry and personal assistant Rob Wilkins took Euan to the press release in a limo. Euan was able to spend much of the day talking with Terry and impressed him enough to invite Euan as his special guest at the upcoming Discworld Convention. After the press conference Terry, Rob, Colin Smythe (Terry's agent), the producer of Hogfather, Rob Brown and director Vadim Jean took Euan to an exclusive visit to The Mob Film Company studios. Euan was shown models of the sets from the upcoming movie. They later went to lunch where Terry presented Euan with a big bag of Discworld goodies, contributed by various friends and companies. He was expecting him in Psephopololis. Jack Zweiblomen and Dr Rjinswand.